Is weight gain the biggest health crisis in America or is it weight loss? With our collective waistline expanding faster than ever, dieting has now become a national obsession. But is our newfound fixation on diet and exercise born purely from a look in the mirror, or are there more insidious forces at work? 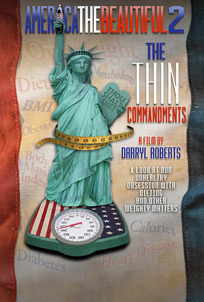 Following up on his successfully distributed grassroots documentary America the Beautiful, award-winning documentary filmmaker Darryl Roberts now explores the relationship between being heavy and being healthy in his new controversial documentary, The THIN Commandments. Which one of these people is overweight? Dwayne "The Rock" Johnson, Hugh Jackman, Jessica Simpson, Tom Cruise, Will Smith, LeBron James, Matt Damon or Christian Bale? Unless you guessed all of them, you're wrong. According to the current BMI scale all of these people are overweight...and Dwayne Johnson is OBESE! In what once was purely a woman's issue, more and more men are being targeted by advertisers to diet or bulk up to resemble the Adonis images on the cover of men's magazines. Covering issues such as America's unhealthy dieting craze, the use of the outdated and misleading BMI scale and the currently touted "obesity epidemic," Roberts debates the widely believed concepts that you have to be thin to be healthy. During his journey, he discovers the plethora of factors contributing to America's body dissatisfaction, many of which are being promoted by doctors, schools, the government, and even the First Lady of the United States. Roberts questions these industries' promotion of weight loss surgeries, fad diets, disorderly eating, and a nationwide fear of fat that causes panic whenever our Body Mass Index passes the number 25. With one of the most advanced medical systems in the world and alternative health modalities at our disposal, is it possible to be healthy at a variety of sizes and weights?